SciBabe Yvette d'Entremont On GMOs, Gluten, & Critical Thinking - What She Said Mar 23rd by What She Said! April 20, 2019 - Visions of Science, DSA Canada, Marion Frazer, Duane Gibson & more by What She Said! April 13, 2019 - Meridian Credit Union, CORD, Ria & more by What She Said! April 6, 2019 - Importance of #STEM education, Helena-Alexis Seymour & more by What She Said! March 30, 2019 - Plan International Canada, Tantoo Cardinal & more by What She Said! March 23, 2019 - Danny DeVito, Alfred & PenguinPickUp, Rhonelle Bruder and more by What She Said! Kyle MacLachlan & Josh Wiggins talk 'Giant Little Ones' by What She Said! 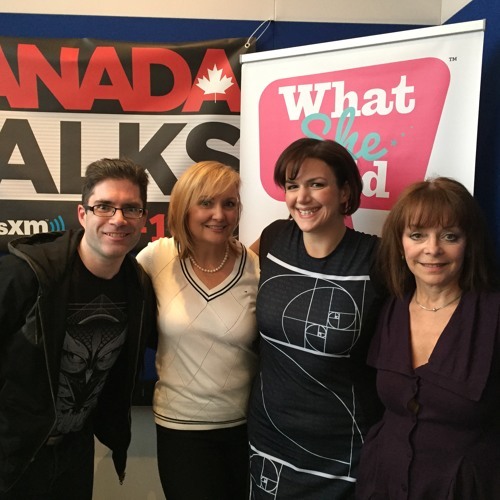 March 16, 2019 - Canadian Liver Foundation, Professor Maja, Melissa Pallister & more by What She Said! March 9, 2019 - tellent, Soroptimist International of York Region, Carolina Bartczak & more by What She Said! March 2, 2019 - Strainprint, Digital Investing, Pier 21, Monty Greig & more by What She Said! Feb 24, 2019 - Umbrella Academy Cast, Sonya K. Singh, Rebecca Higgins & more by What She Said!